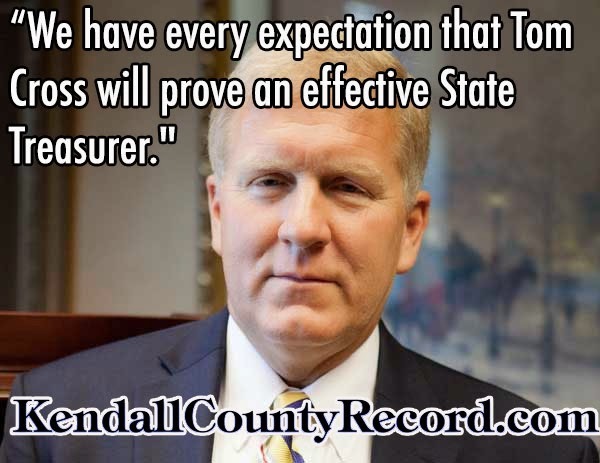 Tom Cross' campaign for Illinois State Treasurer continues to power on with his latest newspaper endorsement: The Kendall County Record. "We endorse Cross in this election based on his impressive record over the past 20 years as a state representative serving northeastern Kendall County. A Yorkville High School graduate and Oswego resident who went on to become the Republican House Minority Leader, Cross helped secure millions of dollars in state funding for a myriad of local public works projects over the past two decades. Those funds helped local school districts pay for new schools, for widened highways... Cross has also been responsive to the concerns of his constituents."